"I like banana bread. A lot." I intended to take more pictures of this banana bread, but my golden retriever Holly decided to go counter shopping for a midnight snack (and therefore deprive my co-workers of a treat). As a result, she has now received a new nickname: Banana Bread. (Fortunately, Holly was smart enough to not eat the plastic wrap covering the bread, and she did not get sick at all.) She even answers to her new nickname. Well, at least this banana bread was healthy for Banana Bread. I saw this healthy twist on banana bread posted a while back on Smitten Kitchen and thought the concept of adding seeds or grains to banana bread sounded good! I did not have millet, which Deb used, so I substituted quinoa instead. Hey, why not add some protein, right? 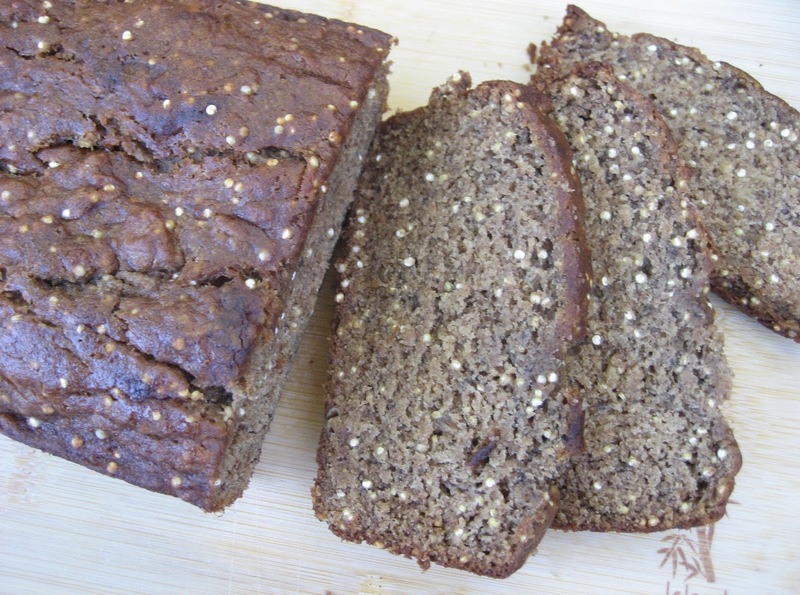 What makes this banana bread healthier, besides some added quinoa? This recipe is made with whole wheat flour, uses coconut oil, and includes maple syrup for sweetness instead of higher amounts of sugar. It is a denser banana bread, and the quinoa added a bit of a crunch to the bite. With summer here, bananas get riper even faster! I will be making this bread again soon but will hide it from Holly. With some nut butter, this would make a quick yummy breakfast that is good for you! Take my dog's word for it. Preheat oven to 350ºF and grease a 9 x 5" loaf pan. In a large bowl, mash the bananas with a wooden spoon or a potato masher until the bananas are smooth. Alternatively, if you are using a stand mixer, you can use your paddle attachment. Next, add the egg, followed by the oil, brown sugar, syrup, and vanilla extract. Sprinkle the baking soda, salt, cinnamon, nutmeg, and cloves over the mixture, and stir until combined. Add in the flour, and stir until combined. Then, add the quinoa and stir. Pour batter into prepared pan and bake until a tester comes out clean, about 40 to 50 minutes. Cool loaf in pan on rack. Awww, who wouldn't love this bread and really, Holly's a people too, right? At least your dog got called Banana Bread today. Guess which Charlie was called "poohead" today? LOL under the dining room table! I'd have given him banana bread if he'd woofed at the door.